Well, hello glam eyes! A bold release that packs a punch of stunning color in just one swipe, Nykaa’s Glamoreyes Liquid Eyeliner is all you need to get the most fabulous eye look on. What's great about this product is its melt, crack and run resistant properties. This refined liner glides perfectly across the lash line for a gorgeous fluid application, leaving you looking super sensational! Nykaa Glamoreyes Liquid Eyeliner - 01 Stormy Sky : Let your eyes stir up the most beautiful storm. This stunning grey toned hue is sure to set you apart from the rest of the crowd! Nykaa Glamoreyes Liquid Eyeliner - 02 Chaotic Calypso :Let eyes that deeper than the ocean! Nykaa Glamoreyes Liquid Eyeliner in Chaotic Calypso is a gorgeous deep blue shade, which is as stunning as its name. Nykaa Glamoreyes Liquid Eyeliner - 03 Enchanting Forest : Let your eyes work the magic with our Nykaa Glamoreyes Liquid Eyeliner in Enchanting Forest. This beautiful deep green hue is sure to take everyone's breath away! Nykaa Glamoreyes Liquid Eyeliner - 04 Mystic Woods : Embrace your mystical side with our Nykaa Glamoreyes Liquid Eyeliner in Mystic Woods. This dark brown hue is nothing like you've ever seen! Nykaa Glamoreyes Liquid Eyeliner - 05 Dragon's Heart : As courageous as the beautiful beast's heart, our Nykaa Glamoreyes Liquid Eyeliner in Dragon's Heart is not for the faint hearted! This stunning rust hue is sure to mesmerize you. Nykaa Glamoreyes Liquid Eyeliner - 06 Whimsical Potion : Eyes that look deeper than the ocean! That's what you'll get with our Nykaa Glamoreyes Liquid Eyeliner in Whimsical Potion. This aqua hue is refreshing and mesmerizing at the same time, making it an absolute jewel! Nykaa Glamoreyes Liquid Eyeliner - 07 Poisonous Plum : Take things to the dark side and reveal your whimsical self with the Nykaa Glamoreyes Liquid Eyeliner in Poisonous Plum. If killing someone with your eyes was a crime, this dead drop stunning purple shade would be charged guilty! Explore the entire range of Eyeliner available on Nykaa. 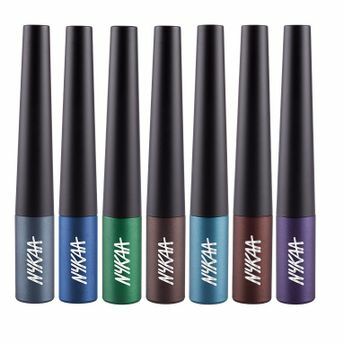 Shop more Nykaa Cosmetics products here.You can browse through the complete world of Nykaa Cosmetics Eyeliner .Alternatively, you can also find many more products from the Nykaa GLAMOReyes Liquid Eyeliner range.